In the lead-up to the relay, I did get to run with and get to know better, a lot of folks in the team (mostly the first team). Loka is a great motivator and kept up the team involvement in the SGLRG runs through the team FB page. The second team (which I was part of), was also made up of some very strong runners but I wouldn't get to know them as well since I did not see much of them at the SGLRG runs. Also, communication between the team was through email threads which rarely generated much participation. The relay requires teams to provide three volunteers or pay $120 per volunteer. I worked to ensure we met our volunteer quota (a Microsoft DL recruit, a volunteer from Andrew's team and Angel's brother). There was also a question on whether we'd be able to fill our 12th runner - after following a number of leads we were able to close on a runner from the previous year. Eddie was fighting an injury and Mo was uncertain of the state of his leg so there was a definite possibility that we'd have to be flexible with the legs we ran. Van 1 (Eddie, Cyrus, Mike, Alvin, Mo and myself) commenced our journey to the start of the race at the peace arch near the Canadian border. Following the GPS directions, we almost crossed the border, turning around at the last moment. After turning around we somehow got back to the border and this time got stuck in the line to cross into Canada. We did not have any passports since we did not intend to head to Canada!! The Canadian officer would not let us turn back to the US because according to him we were now in Canada. He thankfully processed us by denying us entry to Canada. If we entered Canada officially, I learnt that we would be fined about $600 each! A Canadian border car escorted us to the US border truck line. There was a huge backup in the car line and it would have taken us at least a couple of hours if we had to get through that... The folks at the US border were incredibly friendly and were sympathetic to the fact that we were trying to get to the start of a race that started at 2 pm. They still needed to process us through our ids. I was mentally prepared to have to miss the race... Finally, we were all cleared to go except for Mo. He was held (and is still being held at the Tacoma immigration detention facility). We had managed to get through to Loka who had checked us in and picked up our packets. We reached the start line with 5 minutes to spare. I decided to start the race since we really need not want any more dramatics and needed some calm. Eddie would go in as runner 2 so that he could have a flatter and shorter leg which would be easier on his injury. I did not really get much of a chance to reflect on things. I had to pretty much start running soon after getting to the start. There were 8 teams at the 2 pm slot (the 8 fastest teams by projected 10k times), four of which were SGLRG teams. As luck would have it, Nelson was runner 1 on his team. There had been quite a bit of trash talk in the lead up to the race so I most definitely did not want him to beat me! The adrenaline from the start got us off at a quick pace. The first Green Streaks team (Green Streaks+) and a team from Portland (the eventual winners) were off in 1-2. I was behind them at 3 with Nelson at 4. This was the way it stayed to the finish. Nelson was just behind me at mile 2 but I ended up beating him by a few minutes. That would end up being incredibly satisfying :) There was little shade from the sun on the course. I did appreciate the beauty of the bay. I remained worried about getting lost throughout the leg and carefully watched for Ragnar signs. I was quite relieved when I saw the "1 mile to go sign". We also learnt that Van 2 had to go back to Seattle since their van was leaking gas. We learnt about another van that had crossed the border, just that they had more people who had been detained. That's about the most drama I've seen in the first two hours of any relay! Within the first couple of miles I passed a couple of teams. I was helped by a stop light. This was a hilly leg but I felt pretty good all in all. There were some climbs in the beginning but then the flats and downhills felt good. Our hilly SGLRG training runs sure had prepped us well!!! The leg would finish in downtown Bellingham. Towards the end I would pass a 3rd runner. I handed off to Erik for van 2 to take over. I was relieved that they had made it to the transition point in time. It would have been horrendous to make it there but not find anyone waiting for me. As Van 2 ran we had our first RNR break... We stopped at a grocery store to grab some food. I was brave enough to go with Chinese food. My fortune cookie claimed that - "a pleasant surprise awaited me". At the transition point for the next set of legs we ran into several other SGLRG teams who had started before us. I even ran into the team of ex-Chuckit runners. I was amused that Andrew's team van has a #freeMo hashtag on their van. We were treated to a beautiful sunset as we waited. I didn't particularly care much for this leg. I passed one runner in the beginning and then I was alone for the most part. It was a transition from the city to the tranquil scrapes of Skagit Flats. The running surface wasn't that great for running in the dark. Towards the end it had you climbing onto a bridge and then on an obscure road. All along I was scared about going off track. A positive was that I now started seeing Ragnar team vans, some of which offered some encouragement. The execution for our team improved quite a bit on this leg. We didn't get lost once and we started chugging along like clockwork. We started hitting the Skagit flats marathon course and fir island road. Familiar paths from local races, the tulip festival and snow geese watching! Cyrus' run on his leg was just quite inspirational. He averaged in the 6:20s and was just so focused. He also passed Steven and got us ahead of the SGLRG team the KK (who were a friendly target for us). I was shivering while I waited for Cyrus to come in... This is always a great sign, indicating that it will be perfect when you start running. It reminded me of how I felt during Chicago 2012. Wilson was running this leg too. He started off a few minutes before me but I don't know if I ended up passing him. As I began running, I couldn't help but admire the beautiful clear sky, filled with stars... The weather was perfect for running. The roads in Skagit flats as expected were flat. There were also a lot of other runners, providing me with targets to shoot for. Quite a few of them were walking. I ended up passing 19 runners a.k.a. "roadkills". We drove to the second van transition point and settled for some sleep. I slept in the middle seats of the van. Thankfully the van had leather seats. After 23 miles it wasn't going to take much to sleep :) I slept for about 3-4 hours. We decided that I would run a 5th leg to optimize for time. Eddie would run the 25th leg, which was flatter than leg 26. The course scenery had transitioned from the rural flatness of Skagit Flats to the hilly scenic beauty of Whidbey Island. I felt a bit jealous of Eddie as I waited for him to come in. He did have a beautiful vista of the water. Eddie, ended up getting lost again so that put us behind another 6-8 minutes. The KK took off ahead of us. There was just a single runner in front of me as I got started. I passed her and took a turn in the direction, I saw our van go. Luckily they saw me head into the wrong direction and told me to go back. I had a detour of about 0.25 mile or a couple of minutes. The rating of this leg might have been "Easy" but it felt quite difficult due to the steep climbs. I felt aerobically tired... I still ended up passing another 19 runners on this leg. I was glad to be done. Mike had a long and hilly leg. It was quite inspirational to see him run so well. We stopped multiple times to support him with cheers and cold water. Cyrus was going to be getting us home by running the last two legs. He also ran like a man possessed. During his first leg he passed Steven and ended up with us 12 minutes ahead of the KK. 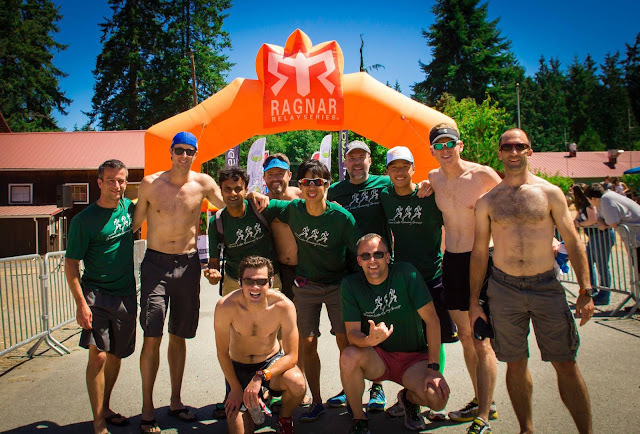 A great part of Ragnar is the team running in with the last runner and the finish pictures with the medals. We finished 7th overall. Had we not lost time making detours we could well have come in 4th. I guess that is an integral part of such relays too! Our Green Streaks+ team came in 3rd. The got beaten by the Portland and a team starting at 1 pm. Will I do Ragnar again? Yes... Either I will do it competitively in an Ultra team to win OR sign-up towards the end with a team for fun! There are always teams in the last couple of weeks looking to fill up their roster. At that point they've pretty much covered the registration fees and are just looking for a warm body to get in miles. Indeed Christy - we sure had a lot of drama to deal with! Unfortunately, Mo still is with them but hopefully all will get resolved soon :( Thanks - you guys did great too! Looking forward to next year! Charge your phone by running?